Discussed are the temperature relationships of linear shrinkage in high-strength nodular iron. It is pointed out that the full magnitude of free linear shrinkage in cast iron mainly depends on the magnitude of pre-shrinkage expansion, and the greater the magnitude, the smaller the total linear shrinkage. On the basis of the investigation results there have been developed a technology for making thick-walled quality castings of blast furnace cooling plates from high-strength cast iron without installing additional feeding risers, a foundry mold technology, and pouring parameters taking into account the use of the effect of pre-shrinkage expansion of cast iron during solidification, as well as a technology of riserless casting using the effect of pre-shrinkage expansion of high-strength cast iron. Key words: Shrinkage, ductile iron, curves, defects, profit, mold, casting. The article presents the results of research aimed at exploring the possibilities of using the river Volga in foundry sands. Researched technological properties of the sand of the river Volga. Its classification has been carried out. After studying the physicomechanical and technological properties of mixtures of water glass, sand-clay and core mixtures, produced on the basis of river sand was concluded on the applicability of the Volga River sand in foundries. Key words: Sand of the river, molding mixture, mixture of water glass, core mixture. The design of НШ32-У type gear pump is presented, the main cast parts of which the pump is composed are listed, and casting methods used to produce it are indicated. Main attention is given to cast barrels being plain bearings and made of Al alloys by various casting methods. Key words: Gear pumps, cast parts, alloys, barrels, casting methods, quality. The article deals with growing trends of industrial robots application, gives description of its advantages (productivity, precision, reproducibility, elimination of human factor etc.) and examples of its use by solving technological tasks in conditions of modern foundry production. Key words: Automation and robotization of foundry production, coremaking machines, Cold box amin-process, modernization of foundry production, modern trends in use of robots. We consider the optimization of casting design concept in its impact with two fluid technological environments, namely, its pattern – with a sand medium, and mold – with metal. Copying in metal structures observed in nature, it is proposed as a method of metal savings and publications listed technical design of castings according to this method. 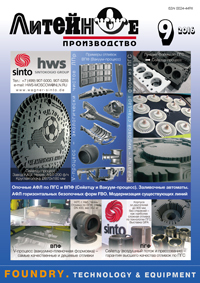 Showing examples of decorative castings, design patterns which reflect the golden section and Fibonacci numbers, as well as castings PTIMA Institute of NAS of Ukraine. Key words: Casting design, metal savings, lightweight casting, lost foam casting, decorative items, the golden section, Fibonacci numbers.